This project will fill my Scrappy Sundays for weeks to come. "Completely Dotty" is from the February 2004 issue of American Patchwork and Quilting. 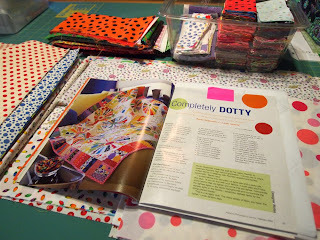 I started collecting polka dot fabrics seven years ago! This is a paper-pieced project, a technique I don't especially like. I made the paper foundations years ago, so the most tedious part of the project is complete. I miss my youngest son, who was my "foundation paper remover." 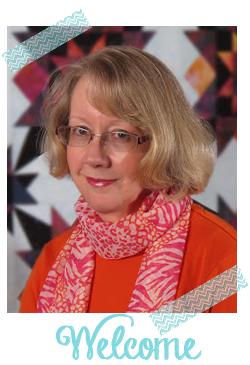 But at quilt retreat in April, I learned a neat trick from Marilyn of Cindy's Quilt Shop in Caldwell, Idaho. Here's how it works: after sewing all the seams on the paper foundation and trimming the block, put the block paper-side-up on a terry cloth towel (or well padded ironing board). Then take a chopstick and run the wide end of the chopstick along the seam. The paper will tear away easily and when removed, won't disturb your stitches. Be sure to use a larger size needle (I use a size 14 for paper piecing) and smaller stitch (2.0 or even 1.5) when sewing paper foundation blocks. And I have this cool "Dots" lunch box to store my pieces in until they're all sewn to the foundations! Here is my first finished block -- except for the center. 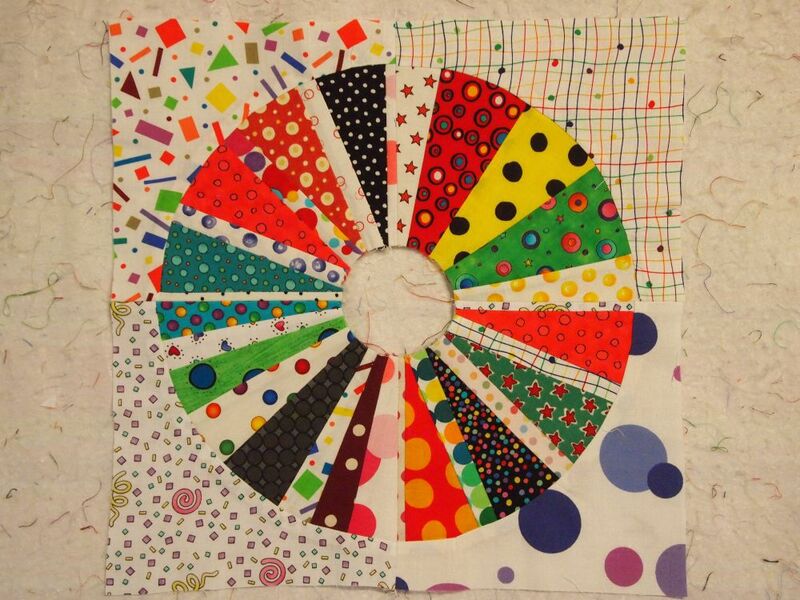 The pattern shows a variety of circles for the center, including spiral applique' or plain colored circles. I haven't decided what I will use, but I have eleven more blocks to make before I have to choose. 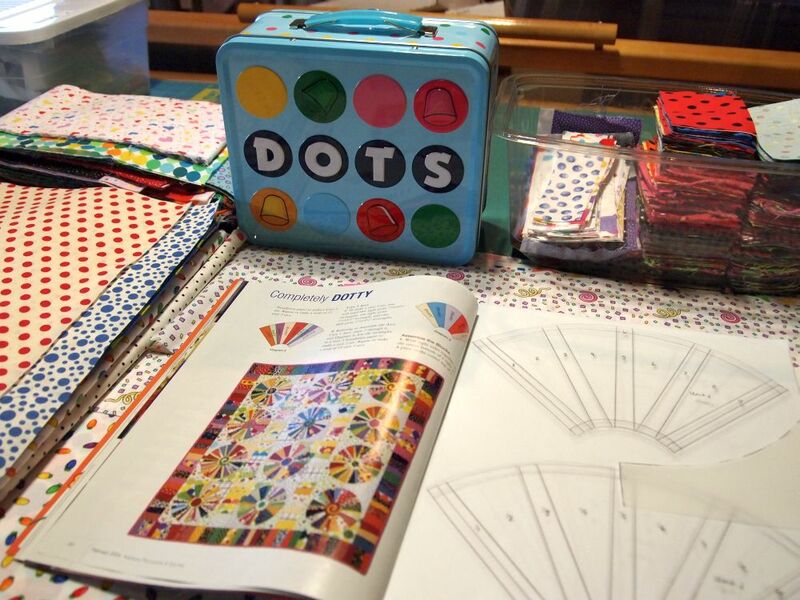 Looks like Sundays will be Completely Dotty for awhile! Another great paper-removal technique is to turn the piece over (on towel or padded ironing board) and lightly spritz it with water. The paper pulls away MUCH more easily, and doesn't affect the block at all. It looks great, though! I can't wait to see it finished! 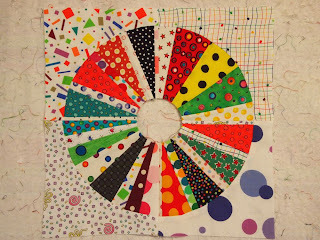 Fab block, I love polka dots! These loans don't require a credit assessment, which ensures that a low credit score background and low credit rating will not likely count against you http://helpn.us/ the medical billing company offering to perform the project will not charge heavily but a tiny percentage from the bill.